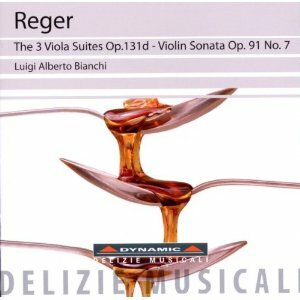 Luigi Alberto Bianchi makes a strong case for Reger's Viola Suites. While they are clearly very difficult, they are not filled with overtly virtuosic music, so their continuing attraction to violists may simply be down to the general paucity of their repertoire. But Bianchi demonstrates that there is some fine music here. He has a rich, warm tone, but that doesn't impede his agility around the top end of the instrument. In general, it is very secure playing, but very fluid too. He often shapes phrases with some quite extreme rubato at both ends, although his dynamics tend to be more stepped, distinguishing one phrase form the next. Reger isn't known as a melodist, mainly because his themes tend to lack memorability, but there is a strong lyrical dimension to this music that Bianchi brings to the fore. I love the way that he deals with Reger's often rambling phrase structuring. Rather than try to focus the end of the phrase on the (often ambiguous) cadence, he usually prefers to let it trail off, as if the composer has lost his train of thought and the performer has no intention of reminding him. As is probably obvious from the above comments, this is not the sort of reading that emphasises the neo-Baroque dimension of the Suites. In fairness, it is not as pronounced here as in Reger's Cello Suites, but even so, Bianchi seems intent on positioning this music squarely at the end of the Romantic period, with all thought of Bach all but forgotten. There are a few exceptional movements, the allegretto third movement of the Second Suite for example, but even here the Baroque formality is only apparent in the dance rhythms and not in any particular metrical discipline in the performance. Bianchi's viola has an interesting story behind it. It is a 1595 Amati, 'modernised' (and Bianchi himself has surprisingly few reservations about that process) by the William Hill workshop in the late 19th century. The instrument was stolen from him in 1980 and only returned in 2005 when it was found in a barn. He is obviously more careful with it now, as it currently resides in Cremona, no doubt in some specialist repository. There are photographs of it in the liner and it is clearly a beauty. The sound quality is fairly good, but there are a few glitches here and there that really stand out, especially when listening on headphones. They sound like tape edits, but given their positions (one is in the first note of the Second Suite) that can't possibly be the case. A gremlin somewhere in the mastering process perhaps? Bianchi's one big mistake on this disc is to open it with Reger's Seventh Violin Sonata, performing it himself on the violin. He is clearly a competent violinist (he started playing in the early 80s, presumably as a practical response to the theft of his viola), but his skills on that instrument don't come close to his mastery of the violin. As a result, the Sonata sounds precarious throughout, with the intonation and the articulation always only just coming up to scratch. His timbre in the top register of the violin also leaves something to be desired, a great shame considering how elegantly he plays at the top of the viola fingerboard. A disappointing filler, then, to an otherwise satisfying disc of Reger chamber music. The sheer Romanticism of the readings make this a somewhat idiosyncratic reading. But then, it is solo chamber music, so you can't blame the player for doing things exactly the way he wants.